On this page we list some of the principal festivals and events in Venice's year. Be aware that during water-borne events public transport can be drastically reduced - details of disruptions are always published on the local transport (ACTV) website and at vaporetto stops. A brief guide to upcoming events can also be found on our What's on page. This is the big one, Venice's greatest tourist event. St. Mark's Square fills with glamorous, sinister figures in mask and costumes. There are masked balls and public parades and crowds of visitors from all around the world. The Carnival takes place in February, during the ten days leading up to Shrove Tuesday. More about the Carnival. The Festa della Sensa celebrates the relationship between Venice and the sea. It involves a procession of boats traditionally led by the doge (nowadays the mayor) who throws a ring (nowadays a wreath) into the waves to symbolise a marriage between Venice and the sea (or Venice's dominion over the sea, depending on interpretation). The event follows Ascension Day, and in 2012 takes place on 20th May. This is a huge and cheerful rowing event which takes place on a Sunday in May or June. In 2012 the date is 27th May. Thousands of participants row around a 30km course, reclaiming the lagoon from motorised boats. More about the Vogalonga. The Biennale started as an art show every two years, and has grown to become an umbrella organisation covering a large range of events, including the Venice Film Festival. The main art exhibition takes place in odd-numbered years, and in even-numbered years is replaced by an architecture show. The next Art Biennale will be in 2011. More about the Biennale. Every year Venice gives thanks for its relief from a severe outbreak of plague in the late sixteenth century. A temporary bridge of boats crosses the Giudecca Canal to the Church of the Redentore. The religious celebrations are held on the third Sunday of July. The night before (Saturday) is a great party with feasting followed by night-time fireworks and the weekend finishes with a gondola regatta. More about the Festa del Redentore. The annual International Film Festival in Venice is part of the Biennale (see above). Although Venice is not a town which offers many chances to see films, once a year it puts on a big show and attracts some important names from the movie world. In 2011 the dates are 31st August to the 10th September. More about the Venice Film Festival. Venice is fond of boating, and this 'historic regatta' is the largest event in the year. A colourful traditional processions of boats along the Grand Canal is followed by competitive racing. 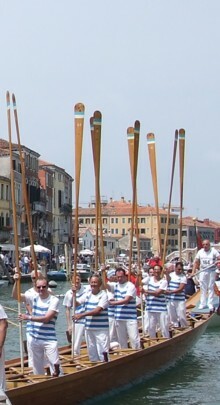 This year the Regata Storica takes place on 4th September 2011. Like the Redentore, this is a festival which remembers Venice's deliverance from disease. Every 21 November a special bridge is constructed over the Grand Canal to the Church of Santa Maria della Salute, and Venetians troop across on their way to special masses, while their children eat sticky toffee apples and tote balloons. More about the Festa della Salute.